After 20,000 miles of flying in nine days, three countries visited in five days, six stage presentations, dozens of press demos and even signing a few autographs...I'm home. To celebrate, I woke up early for a morning spin at Cycle House LA and an hour easy run after. Steph is sick, so I went to the Farmer's Market next door to pick up some berries and a smoothie to help her recover. Of course, in true Stephanie fashion, she wants to rally today but I'm hoping she'll rest up. And I'm not-so-secretly trying to stay home anyways. As you can imagine, I've had enough of moving about from place to place, literally living out of my suitcase. View from the stage in Taiwan, where we held a press conference and fan demo for 600 eager Xbox aficionados. The trip itself was a huge success. Many people in each market we visited hadn't heard much about Sunset Overdrive. That changed in our favor, as several fans at each tour stop told me they were pre-ordering the game. And the press were unexpectedly animated and complimentary about the game. "The Ferrari 430 Spider. If you have the means...I highly suggest picking one up." Of course, the highlight of the press trip had nothing to do with media meetings. 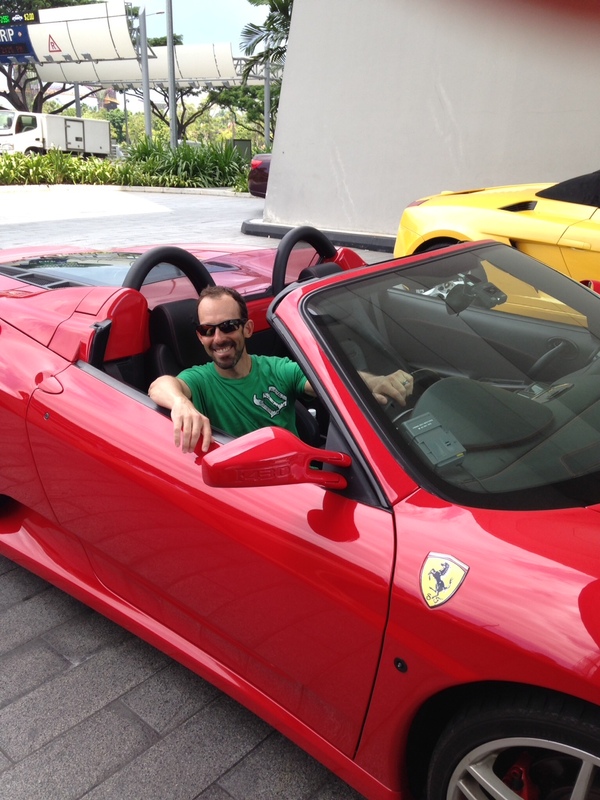 Instead, it had everything to do with driving a Ferrari 430 Spider on the Singapore F1 Grand Prix circuit. Even if I drove...conservatively. After all, it was my first time driving on the "wrong" side of the street, and with the steering wheel on the Western "passenger side" of the car. Still, I gunned it a few times, enough to feel the Ferarri's power and acceleration speed. We also went indoor skydiving at the world's second largest indoor skydiving venue. Training-wise, I probably maintained or slightly lost some fitness. In between all the travel, I squeezed in just over six hours of workouts. The heat and humidity in Singapore provided a real physical and mental challenge to overcome, but I'm glad I had the opportunity to run on the SAFRA Singapore Half Marathon course after the sold-out race ended. The Army was still cleaning up the course and all the aid stations still contained buckets of ice, which I liberally used to try and stay cool. The soldiers were cool and even cheered me on a bit as I ran alone in what amounted to 97-degree heat. The week's fitness highlight though was running up to the Seoul Tower in Korea with Beeoh Kim, a Fortius Racing teammate and well-known Korean pro triathlete. We caught up a lot about living in Korea, which sounds pressure-packed at times -- especially for women. It's a culture driven by an obsession with perfection or success, punctuated by women feeling a need or desire to keep up through plastic surgery. Me and my buddy Beeoh. The taxi ride after he and I dined was priceless. The cab driver didn't speak English, but tried admirably by making lists of things Korea is known for. One example, "Chevrolet 1! Toyota 2! Hyundai 3! Kia 4!" In thinking about the trip, I came away with a number of impressions about life in Asia...and a few training insights too. Outside of needing cash to get from the airport in Singapore to the hotel at 3 a.m., I could use credit cards wherever I traveled. We indeed live in a paperless cash world -- though if you have Visa in Singapore you're out of luck for a taxi. MasterCard and AMEX only. If you ever have the opportunity to fly Singapore Airlines business class, I can't say enough good things about the experience. Despite six different flights in nine days, I always looked forward to getting on another Singapore Airlines plane. And Thai Airways' economy class was a pleasant surprise -- far better than any domestic carrier. Singapore features the most modern architecture I've seen outside of Melbourne. I felt like I was on the set of Star Wars. Seoul seems like it's in the middle of a struggle between modern and traditional. Beautiful skyscrapers pierce the sky amidst an jigsaw puzzle of concrete apartment buildings. And it has the worst traffic I've ever encountered -- worse than New York City, Mexico City and Los Angeles. I talked with a couple Taiwanese folks who said the biggest misconception Americans have of their citizens is that "we all eat dogs." In truth, I saw pet dogs everywhere in the city. They are treated with love and respect just like we do here. What a sad thing for people to have to clarify. When I travel for international business in the future, I'll do a better job of checking in advance for local races. I missed an opportunity to run a half-marathon that would have been awesome. If you travel to Seoul, the Grand Hyatt is amazing...with a solid gym and an indoor 25 meter pool. In Taipei, the W Hotel is a must. Outstanding across the board, and a 25 meter outdoor pool to squeeze those swim sessions in. Taipei is the home to Giant bicycles. Apparently, it's quite easy to rent a road bike in the city and there's plenty of places to ride. Outside of Hyundai and Kia, PSY is Korea's biggest export. There's a giant "Gangnam Style" sign at the Gangnam train station where tourists like me could take photos. That's my hotel, the Marina Bay Sands, in the background in...Coruscant...err Singapore. This week, I'll be refocusing my training and hope to race the Malibu Triathlon this Saturday -- if I don't get sick for a third time after international travel. I have no business racing given my physical conditioning at the moment. But I have a belief that I can still perform at a high level. We'll see how far belief and attitude can carry me.